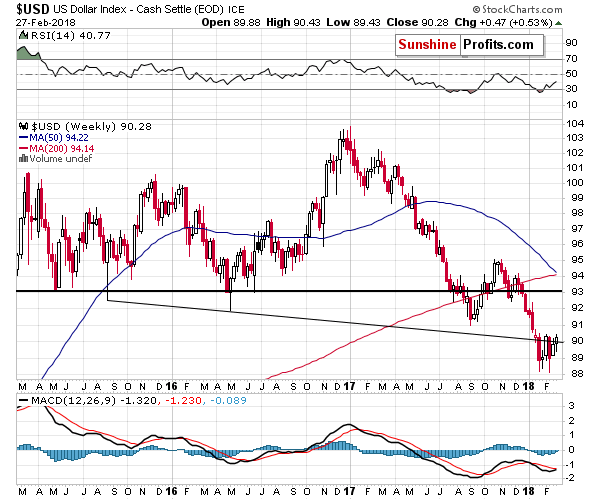 Another downturn in the USD Index would likely trigger a corrective upswing in gold and silver, which would in turn cause the prices of mining stocks to move higher. The “problem” here is that the USD has just invalidated the breakdown below the declining medium-term support line, which significantly lowered the odds for another short-term decline. Let’s take a closer look at what happened, starting with the forex action (charts courtesy of http://stockcharts.com). From the short-term point of view, it’s clear that the USD Index has broken above both declining short-term resistance lines. 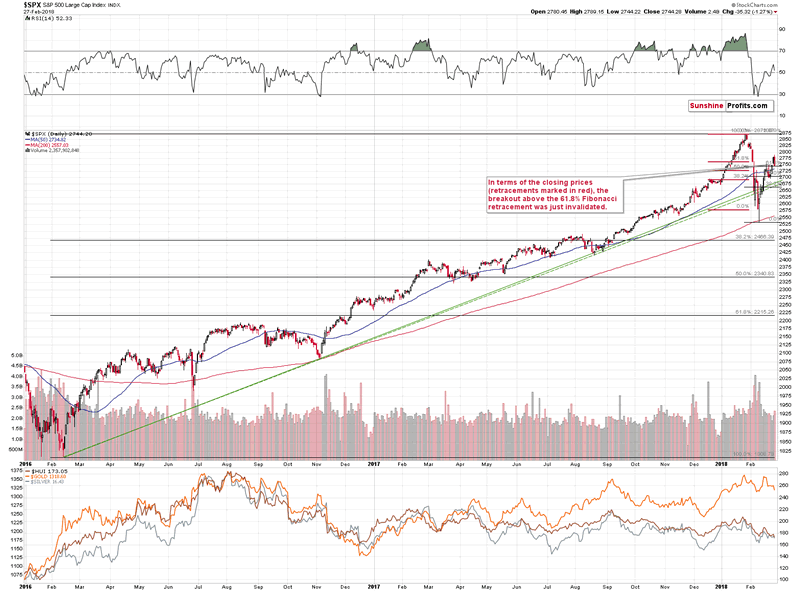 It hasn’t broken above the previous February high, but the implications of breakouts above the declining lines are already significantly bullish as they were two of the things that stopped the rally about 3 weeks ago. The third – and most important – thing that stopped the previous attempt to move higher was the long-term declining resistance line based on the 2015 and 2016 lows. Both are important, so the line based on them is also important. If a line is important, then a breakdown below it is also important, and the invalidation of the breakdown can be even more important. That’s what we saw during yesterday’s trading – the USD rallied above the mentioned resistance line, thus invalidating the previous breakdown. The implications are already bearish, but they will be much more bearish when we also see a breakout above the previous February high and at least two weekly closes above it. Since the previous move above this line was followed by new lows in the USD (in the following week), we are still a bit skeptical toward yesterday’s move. Still, overall, it was a bullish development and based on the short-term breakouts that we discussed earlier, this invalidation has a much bigger chance of being a true one. On the long-term chart you can see why we were very skeptical toward the possible long-term bearish implications of the previous breakdown below the mentioned declining support line. It’s because a much more important support was reached, and it held. Precisely, there was only a tiny breakdown below the combination of support levels and it was invalidated immediately. 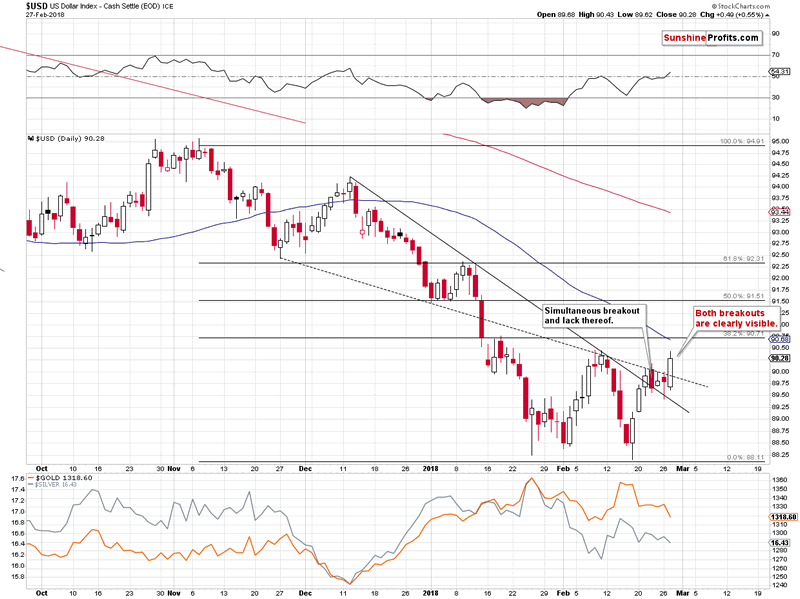 The above has been the reason for one to expect the move back above the declining resistance line. Yesterday’s session proved that the above expectation was correct. Moreover, thanks to the simultaneous breakout above the declining short-term resistance lines, the odds are that rallies will follow. Still, if silver is to outperform gold and the former is to move close to its recent short-term high, then gold should not move as high. The volume that accompanied Monday’s move higher was rather low, which suggests that the strength of the bulls is limited. It fits the scenario in which gold moves higher for a few days (to gold’s cyclical turning point which is marked with a vertical line) or a week and a few days and then starts a big slide. Again, there are multiple long-term factors in play that favor lower gold prices and they could trigger a decline regardless of the short-term signals – the surprises can and are likely to be to the downside. 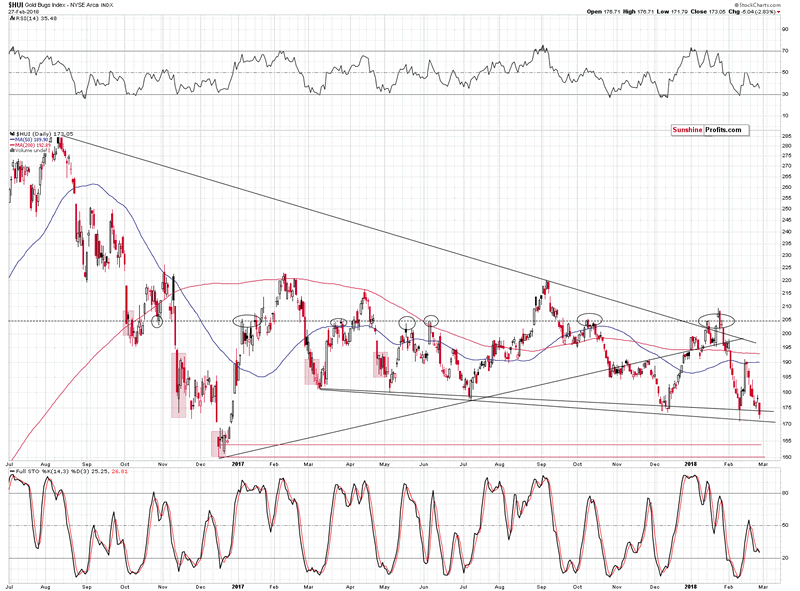 Consequently, the medium-term outlook remains bearish, but just as we are skeptical regarding the USD’s breakout, we are still skeptical regarding gold’s short-term breakdown below the rising support line. Yes, it’s bearish, but we will not be surprised by another attempt to move higher before the big slide starts. 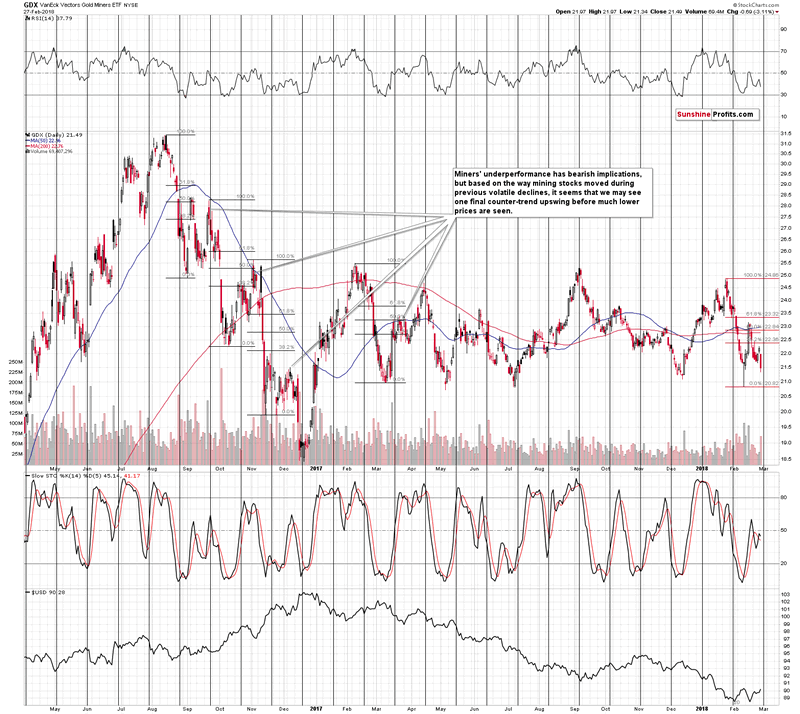 The latter is certainly possible in light of silver’s self-similar pattern. During yesterday’s trading, silver moved a bit below the rising short-term support line, but closed right at it, without a meaningful breakdown. The volume that accompanied it was significant, which is bearish, but please note that since the back-and-forth movement in silver still continues and the self-similar pattern remains in place, we should still take into account the possibility of a quick upswing right before the slide. More importantly, this time, the breakdown was not triggered by a huge and volatile decline in main stock indices. The S&P Index is above the 50% Fibonacci retracement based on the decline, so it’s definitely not moving to new lows. Therefore, the gold stocks’ performance represents true weakness of the PM sector. 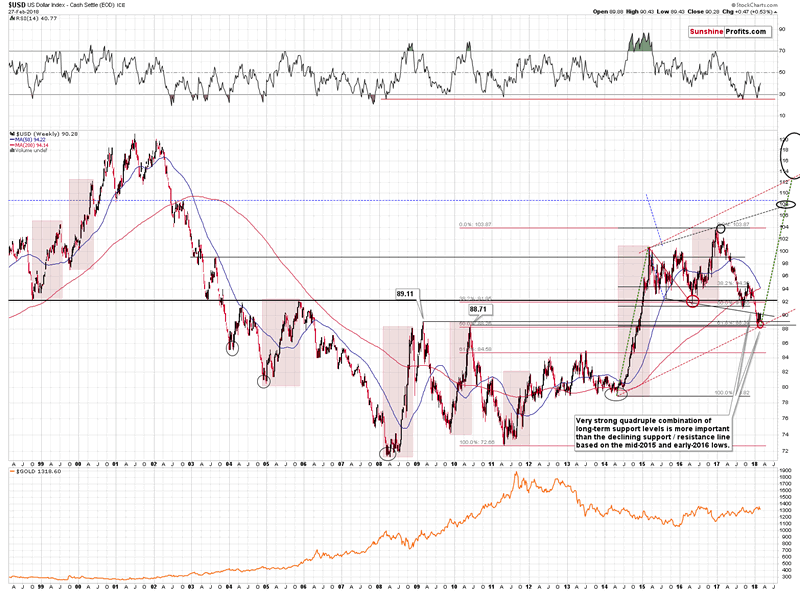 But, does the above rule out the possibility of seeing another move higher before the big slide in the miners begins? It’s definitely less likely than it was before yesterday’s session, but it’s still possible. As a reminder, during the previous volatile declines, gold and silver mining stocks quite often corrected twice before another big wave down started. Is this time any different? It could be the case based on the mentioned breakdowns in the ratios, but it’s not certain. While we’re at it, we would like to provide you with a reply to a question that we received about using the RSI to time the upcoming bottom in the GDX. Our price targets may (and it even seems likely) correspond to the RSI below 30, so the question is if the targets are not too low. Here’s our take. It seems that we have entered the stage in the precious metals market where aggressive downside targets for mining stocks are justified. The reasons are the key breakdowns in the HUI to gold and the HUI to S&P ratios that you saw in Monday’s alert. Based on them we should expect a lot of negativity from mining stocks in the coming weeks and months. The RSI around (!) 30 is a bullish factor, but please keep in mind that targets based on prices are more precise than those that are based on the RSI. The key thing, however, is what happened during the 2013 decline - as that’s what we think is likely to be seen once again. 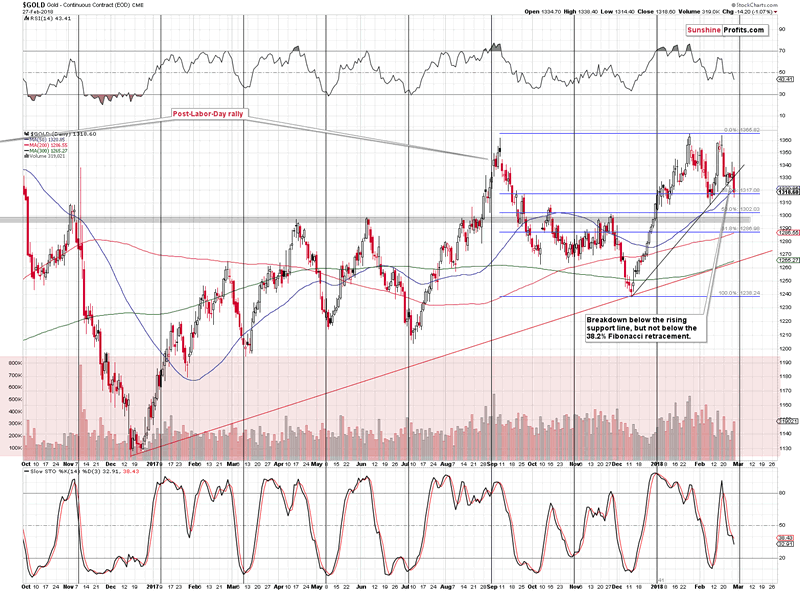 In late January 2013, the RSI around 30 served as a good buy signal but only for the immediate future. In fact, for many investors, it would have been better to stay short at that time. Most subsequent bottoms were formed with the RSI at or below 25 and exiting positions with the RSI at 30 would have been very premature. Concluding, the RSI may not be as effective in the next several months as it was in the past 2 years or so. Even if it is, bottoms may form with the indicator a bit below 30, instead of being a bit above it. Consequently, it seems better to look at the price levels based on support lines, retracements and other techniques than to put huge weight to the RSI’s indication. It’s still going to be important, but not to the extent it used to. The less-popular white metal provides us with important short- and medium-term signals, but only if one knows where to look. The volume that accompanies the weekly upswing is the thing that can help us determine what kind of move we should expect. 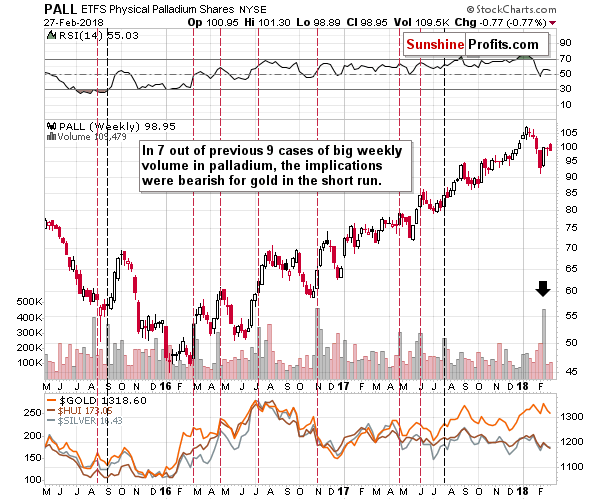 The size of the palladium market is limited and it’s not as popular as gold or silver, so sudden increases in the buying activity may imply big upswings in interest among individual investors (this market may be too small for many institutions). Where do people want to “buy buy buy!”? At the tops. 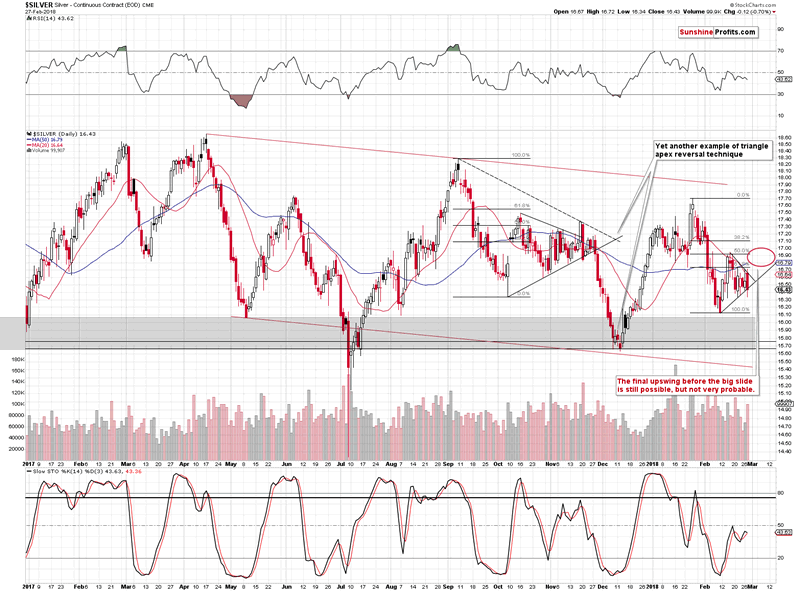 Therefore, the big increase in the volume may indicate a surge in the sentiment, which in turn indicates a local top. The above worked in 7 out of 9 recent cases, so it seems that the above kind of link does indeed exist. Consequently, the implications of the most recent weekly upswing are bearish and the above strengthens the already bearish case. Summing up, the top in gold, silver and mining stocks is probably in, but there’s still a possibility that the PMs’ decline will be delayed by a few days or a week. Mining stocks and – in particular – silver will be the assets to look at for necessary confirmations before making adjustments to the current trading position. However, based on the information that we have today (we’ll provide follow-ups in our daily alerts), it seems that in both cases the outlook for the following months will remain bearish.